St. Patrick's Day is often an excuse to drink green beer, eat corned beef and cabbage, and embrace a stereotype that has little to do with the people and the place that this holiday is really meant to commemorate. The truth is that Corned Beef and Cabbage isn't a very Irish dish. It is American. And the green beer thing? That is just a way to pass off cheap and bad beer as palatable. While my recipes in this collection aren't any more authentic, they have the virtue of being delicious and well worth the holiday, so fire up the grill, heat up the smoker, and make something great this St. Patrick's Day. Every store rolls out the corned beef for St. Patrick's Day. The problem is that most people don't know what to do with it. It gets boiled and baked and served dry with cabbage. That is a real shame. Corned beef is already cooked and perfect for so many uses. 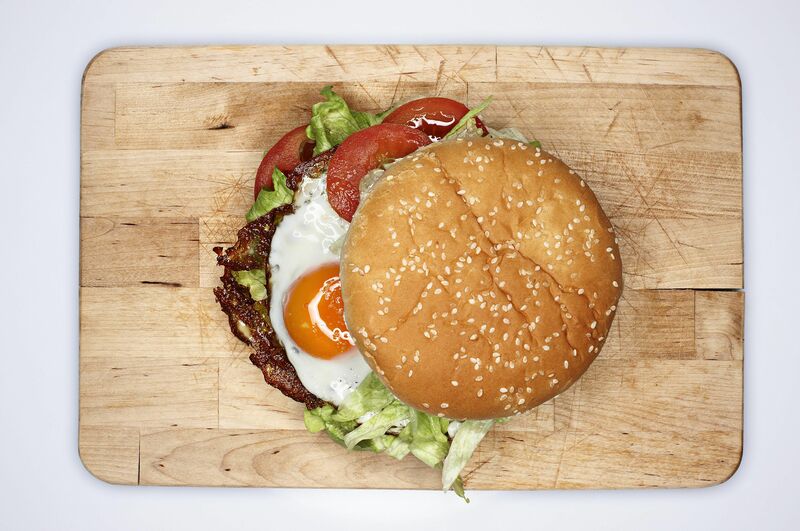 This burger gets topped with finely chopped corned beef and a fried egg. It is truly and an incredible burger that will be a favorite all year long. No cookout is complete without a great potato salad and this one is quick and easy. Based on the classic recipe, this one gets a hint of tangy flavors and just enough dill pickle to lift it up to perfection. This is one of my all-time favorite potato salad recipes. Lamb is the classic meat of Ireland and this lamb leg goes in the smoker to give it a deep and rich smokey flavor. The slow roasting ensures a tender cut of meat and the potatoes smoke underneath the lamb to combine the flavors. This dish is simple and yet elegant and perfect for any occasion, but its roots in Irish Cooking make it perfect for St. Patrick's Day. Flank steak is a perfect cut for the grill. All it needs is a little time in a good marinade before hitting a hot and fast flame. The typical flank steak is large enough for 2 to 4 people and should be served sliced for maximum tenderness. This Irish-inspired flank steak is simple in flavor but has a sweetness that makes it truly fantastic. The rib-eye is, or course, the top steak of choice. Tender and flavorful, many people will say to simply add salt and pepper and grill hot and fast. These steaks, however, get topped with a rich Guinness and onion sauce that is absolutely incredible. It is so good you will want to make it for all kinds of dishes. Salmon is, of course, a very popular fish in Ireland and this recipe layers on a rich whiskey based glaze that adds flavor and helps to caramelize the surface. This is a quick and easy salmon recipe that is perfect for celebrating St. Patrick's Day. For that quick St. Patrick's Day gathering, this is the perfect appetizer. What makes these potato skins better than others is that they are cooked on the grill. This adds a more intense heat and a touch of smoke to enhance the flavor of the bacon. Give these a try and you will be making them all year long. Regardless of what meat you want to grill or smoke this St. Patrick's Day, you might want to start with a great marinade. This one uses the power of Guinness beer to tenderize and add a deep layer of flavor. Stout is a great flavor and as it cooks the bitterness breaks down into a sweetness that is perfect for any kind of meat you want to use this on.